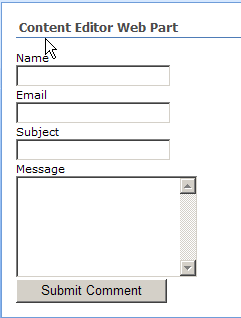 This post I’ll show you how to create a simple contact form using Jquery, web services, & the content editor. This form works best for internal web sites were bots will not repeatedly submit junk to your list. So let’s start. You should now have something like this. Step 2) Ok now well setup the content editor webpart with the jquery references and start with the connecting to the list via webservices. So this takes care of submitting data through a content editor web part to a list, there are of course other better ways to do it. But if you are confined to using a content editor web part then this will help you. I am a SharePoint & Office 365 Developer, Designer & Brander. Office Servers and Services MVP. "@Beau__Cameron looking to step it up if possible, something we want to try next weekend for Azure Bootcamp but poss… https://t.co/091W0GtdFZ"
Copyright © ThomasDaly.net. 2019 • All rights reserved.